The Council urged politicians to stand collectively in solidarity with the minister against all forms of religious abuse or intolerance. 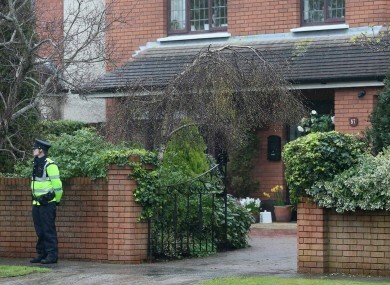 A Garda stands on duty outside the Minister for Justice, Alan Shatter's, house in South Dublin this afternoon. THE JEWISH REPRESENTATIVE of Ireland today expressed their “revulsion and abhorrence” at the anti-Semitic message that was sent to the Minister for Justice Alan Shatter’s home this morning. following the incident at the home of Justice Minister Alan Shatter TD earlier this morning. An image of Nazi soldiers at a rally was contained in a package, along with white powder, arrived to the Minister’s home in Ballinteer, south Dublin earlier today. The Jewish Representative Council said it was “deeply disturbed by this morning’s event here in Ireland. It highlights a growing trend across Europe where political discourse and support is growing for parties and groups who adopt racist views in politics”. They added that “in stark contrast to these trends, Ireland through its Minister for Justice Alan Shatter had organised naturalisation ceremonies for applicants seeking citizenship in Ireland, where he stresses the importance of a common Irish citizenship drawn from diverse cultures, creeds and previous nationalities”. The Jewish Representative Council of Ireland expressed their support for the Minister and his family following this incident this morning and encouraged all those in the political process, “from whatever persuasion they may come, to put politics aside and stand collectively in solidarity with the Minister against all forms of racism, religious abuse or intolerance”. The Chair of the Jewish Representative Council of Ireland, Maurice Cohen said it was “ironic” that the incident occurred the day following a reception held in Áras an Uachtaráin by President Michael D Higgins to honour the occasion of the 8th meeting of the Annual Anglican / Jewish Commission being held in Dublin. Email “Jewish Council express revulsion at anti-Semitic message sent to Shatter ”. Feedback on “Jewish Council express revulsion at anti-Semitic message sent to Shatter ”.